It’s big, bold and pretty! 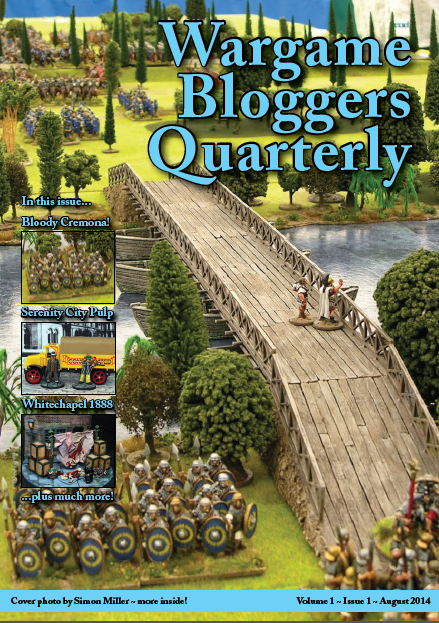 There is a new quarterly wargames magazine available in the Internet called Wargame Bloggers Quarterly. This is, as the title suggests, a quarterly magazine designed to highlight the best looking of games and and reviews. I have had a quick look through issue one and I am impressed. No fancy tricks, just good solid text and images. Well worth having a look – I know what my lunchtime reading is today … and tomorrow! Next Article Digital Wargame Magazines Overdo It! I don’t often reblog a post, but Wargame Blogger’s Quarterly is such a neat idea, I’m really taken with it. Tip of the hat to Thomo for finding this and I’ll definitely be investigating it in the future (and who knows, maybe something from here will be on there, but I doubt it!). Yeah, to get something from here into there, well, I would need to lift my background scenery game a lot and living a somewhat itinerant lifestyle, that’s easier said than done. Ian, do you have a link for this blog? Only http://canisterandgrape.blogspot.com/2014/08/announcing-wargame-bloggers-quarterly.html?m=1 and the G+ page for them which I’ll needed to get to my pc to give you a link towards as I haven’t worked out how to do that on the phone. Hi Ian. I’m Millsy from Canister & Grape and the Editor-in-Chief of WBQ on Issue One. Thanks very much for the shout out! Really glad you enjoyed it. Issue Two promises to be bigger and better again.